These biscuits have become a favorite here at Pendle Hill and tend to make an appearance at our cozy, family-style dinners on Sunday nights. The recipe is versatile enough to be adapted for whatever add-ins you feel drawn to; we’ve enjoyed adding chives, garlic and bacon – even cranberries! 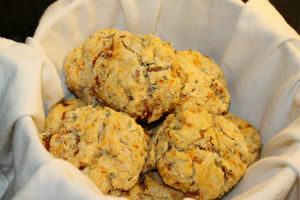 The biscuits turn out fluffy and light, thanks to the yogurt, and don’t require quite as much butter as other recipes. Mix dry ingredients and gradually cut in the cold butter (works best in “pulse” mode on a food processor). Add in the yogurt, tomatoes, basil, and cheese and form a shaggy ball. Roll out dough on a lightly-floured surface and cut into rounds using the lip of a glass or a round cookie cutter. Bake in a 415 degree oven for anywhere from 10-15 minutes – watch them carefully!